Ever since the human species discovered the use of tools for everyday tasks, all manner of tools; mostly rudimentary, have been witnessed across different cultures and civilizations. The earliest documented evidence of saws points toward the use of serrated materials. The said materials included shark teeth, flint, obsidian, copper, and seashells. Modern saws are mostly made of iron, steel or several other durable materials. As far as mechanization and power are concerned, the 21st century has seen the advent of the powered saw. The market awash in a variety of power jigsaws each resembles the next yet different in some aspects. The search for the best jigsaw is on. A pocket knife can be defined as a portable and foldable knife that can be carried around in the pocket. They are versatile and are mostly used for mobile purposes such as self-defense, cutting or opening an item. Here are some best pocket knife brands you should consider to buy in the market. Dewalt dcf887 Dewalt has come out with a new 20v Max Impact Driver, model DCF887. It was launch after older model DCF886, and it appears to be closely base off of the DCF886 design. The DeWalt DCF886 impact driver, which is our best cordless impact driver my pick and features the singer variable speed control. But The Dewalt DCF887 has some different with the older model feature. The new brushless motor impact driver, DCF887 is shorter than DCF886, and it features 3-speed control separate, and it is higher than previous DCF886 nearly 22% powerful at its highest speed and torque setting. Dewalt DW 745 is a table saw primarily used by woodworkers who need to saw through timber for making shelves, shelving materials, cabinets and timber for making doors, countertops, ramp shed and sidings. It is a powerful table saw that features a 10 inch, 24 tooth blade which spins at 3850 revolutions per minute. This saw has a 20-inch rip capacity and a rack and pinion fence design that delivers accurate and smooth fence adjustments. It is manufactured by Dewalt Manufacturing company, a toll constructor that is headquartered in Maryland, Baltimore USA. 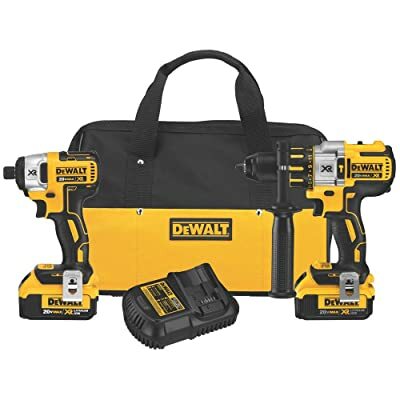 DEWALT DCK296M2﻿﻿ 20V XR Lithium Ion Brushless Premium Hammer drill and Impact Driver Combo Kit is a very effective and efficient drilling and driving tool which is generally used for household and commercial use. With its heavy and powerful functionalities, drilling tasks can easily be performed with perfect finishing. This power tool kit comes with ¼ inch impact driver, ½ inch Hammer drill, 20v Max Lithium Ion battery, bit holder, charger, 2 belt hooks, side handles with 360 degrees rotating feature, along with the contractor bag.